It’s looking amazing! 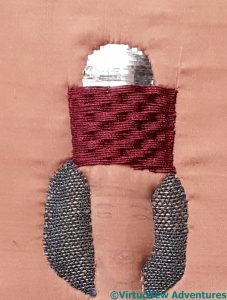 I love Basketweave, it has to be may favourite Goldwork technique. You are a smart cookie! The result is great, too! That’s an excellent idea. I will have to remember it. Ha, that’s a pretty nifty idea Rachel! With my St. laurence piece I had no plunging of threads as the medieval embroiderer just did not work that way. They just placed some extra stitches over the thread and cut it off. It has turned out really well – worth all that effort to bury your ends. The ways you make things are never ending and so fascinating to me. I would never have thought to do it that way. I think your idea for the rest of it is intriguing and look forward to seeing the changes when you come back to this. All that plunging has worked well! It looks very neat and tidy, and the colours are just beautiful. You are well rewarded after all that sinking threads work. 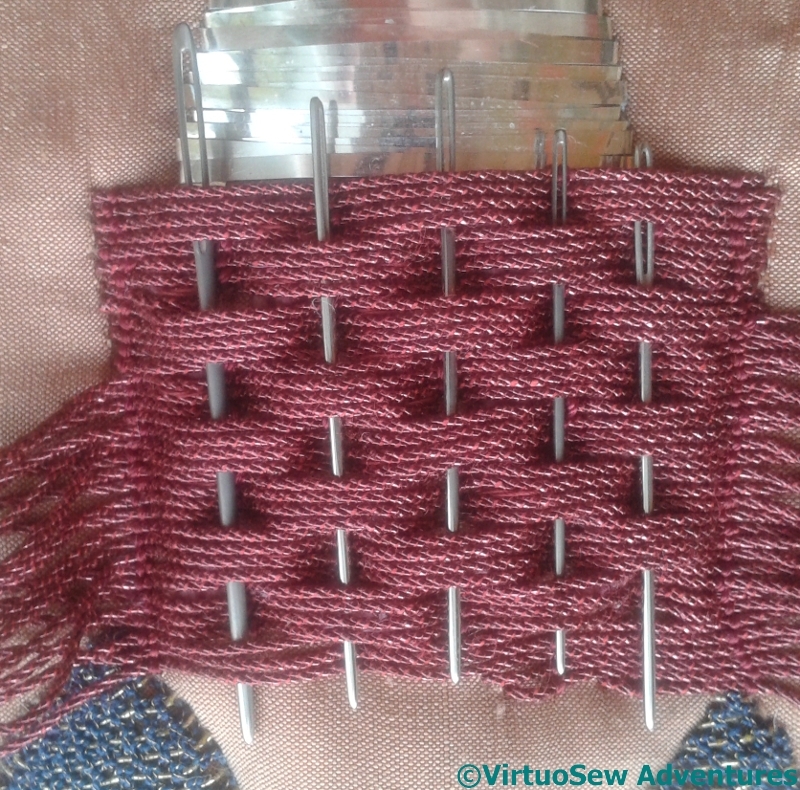 The result is a perfectly beautiful basketweave. The basket weave looks amazing. The needles must have kept the weave in place, a smart idea. 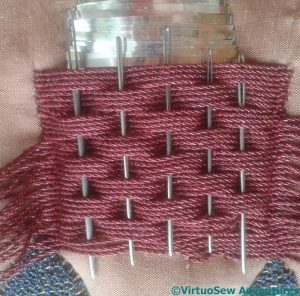 Yes, you’ve made a fine job of the basket weave. I imagine that sinking so many ends takes a good amount of willpower. Mind you, I rather like the photo with all the needles stuck in it – a sort of Stitcher’s Crown. I can see why that would have taken several sittings to complete! That basket weave is amazing. I’m so late getting around to visiting everyone but I wanted to pop by to thank you for linking up to March’s Stitchery Link Party. oh this is beautiful…the image of the needle resists literally had me salivating. Process…process illustration/demonstration…perfect.